Absolute leader in sales, the model brings together the best and most modern aspects of the sector. It boasts exceptional speed and range, high performance in hovering, and a higher safety margin. It also has the largest cabin of the category, in addition to items that make its operation much safer. When it comes to technology, the Bell 429 is at the forefront of helicopters. It stands out due to its modern BasiX-Pro avionics, which give the aircraft a modern fully integrated Glass-Cockpit suite, the extensive use of composite material in its structure and components, and the fact that it is the world's first helicopter certified for WAAS (vertical landing approach on autopilot). The Bell 429 does more for you when it comes to cost savings. It is the first helicopter certified to follow the MSG-3 maintenance process, which is faster, with longer intervals between inspections and less downtime for the aircraft, resulting in lower operating costs. Any trip is much more enjoyable when you are aboard this super-machine. Its spacious cabin and the ergonomic features available maximize the level of comfort. The model also boasts the lowest vibration level in the category, including during landing and takeoff, resulting in the smoothest flight in the category. The model is also available in the WLG version (with retractable landing gear), serving a market segment that considers the wheels essential equipment in its operations. The VVIP version has a luxurious interior, with an unparalleled finish design. It also features innovative seating design, noise reduction technology and can carry up to eight occupants with maximum comfort. 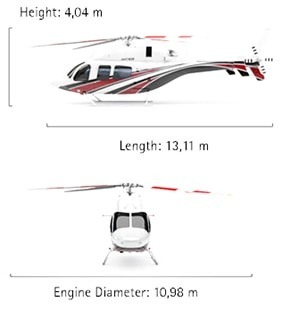 With a modern and attractive look, the visual design of the Bell 429 replicates the excellence of its project design. With a spacious cabin, the largest in the category, the model can comfortably accommodate up to seven passengers and one pilot, or six passengers and two pilots, all in seats with impact mitigation. 2 MTOW, 4,000 ft, ISA.